However, there is (still) a small catch: So far, it has only been possible to coat the iron particles with antibodies that recognise one type of bacteria – but many different types of bacteria may be involved, depending on the species causing the blood poisoning. Using blood analysis, doctors must therefore first determine which bacteria is causing the poisoning before the appropriate antibodies can be used. "This blood analysis is time-consuming and time plays a vital role in the treatment of blood poisoning," explains Herrmann. This is also the reason for magnetic dialysis rarely having been used to date. But a team at the Harvard Medical School led by Gerald Pier has now developed an antibody that can bind almost all the bacteria that can trigger blood poisoning - so if there is a suspicion of sepsis, the magnetic treatment could be started immediately, regardless of which pathogen is in the blood. This "allrounder" antibody to succeed in isolating pathogenic bacteria - similar to using dialysis. The method is not yet sufficiently mature to be used on patients. In a next step, Herrmann wants to carry out tests with various other germs and find out whether the Harvard antibody can actually bind additional bacteria to itself. The nature of the iron particles is also not to be underestimated. It may be the case that some particles remain in the blood after the magnetic extraction has been carried out. The requirements for these carriers are thus clear: they must not harm the human body. But Herrmann's team already has a solution ready in this regard. The tiny iron particles are assembled into larger clusters and are thus more responsive to the magnet. 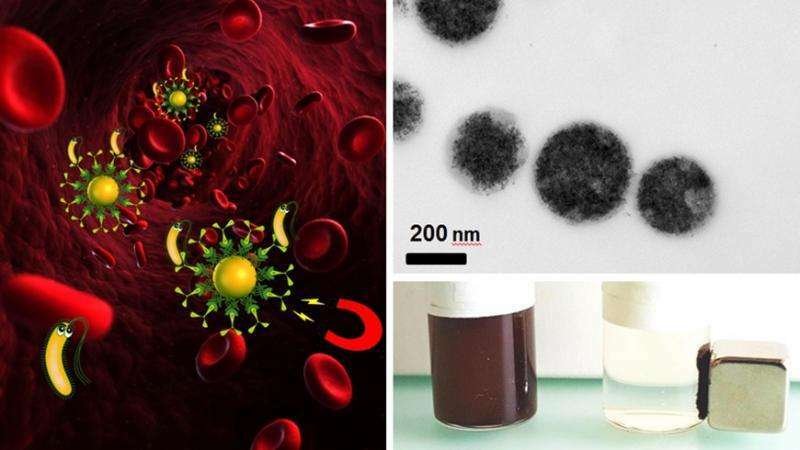 In addition, the researchers have been able to demonstrate, in an in vitro simulation, that the iron particles are broken down completely after only five days. This idea is currently just a future ambition, as there are still numerous issues that need to be clarified. Firstly, it is imperative that this method is used in the initial stage of sepsis, when the damage has not yet spread from the blood to the organs or bodily functions, and there is also the issue of how well this treatment will work in unstable patients or patients with pre-existing conditions. But Herrmann and her team are optimistic - and also a step closer to achieving a new and more gentle treatment for sepsis.